One of the hidden gems of traditional Islam in Makka is the teacher of our teachers, the Husayni Sayyid, Allamah Ahmad al-Ruqaymi. During his teaching career he was known for his mastery of a range of sciences and regularly taught works as diverse as Sharh Ibn Aqil in grammar, Tafsir Nasafi, logic, the books of hadith and complex calculations in inheritance law, not to mention the Shafi’i school. He is the teacher of countless students who have travelled to Makka to study in its circles of traditional knowledge. Shaykh Yahya Al-Mulla studied with him back in the 1970s when he was a student at Dar al-Ulum Makka, as did Shaykh Khalid Turkestani, who read a number of works with him privately and provided me with the information presented below. It is unfortunate that elderly scholarly gems such as Sayyid Ahmad are virtually unknown in traditional circles in the West, despite their producing generations of scholars and dedicating their lives to teaching. How many a student has visited Makka a number of times and had no idea that scholars of his calibre were actively teaching? Alhumdulillah I was fortunate enough to visit the Sayyid a few months ago at an appointment he gave me despite his Ill health, when I entered his run down flat I was taken to his room where he was lying down with the Tafsir of Imam al Baydawi resting on his chest so it would face him so he could read it. He was kind enough to narrate the hadith of mercy to me and had to be pulled up to an upright position to allow him to sit up. May Allah Most High protect him and give him a long life filled with worship. 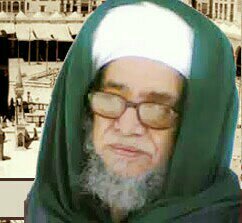 He is the most learned scholar, hadith specialist and jurist: Sayyid Ahmad bin Abdullah bin Abd al-Aziz al-Ruqaymi al-Husayni al-Shafi’i previously of Yemen and now of Makkah. He was born in 1350 Hijri in Yemen in the area lower Wassab, which is east to the city of Zabid. He was raised by his parents and his religious ubringing was undertaken by his father Sayyid Abdullah, with whom he studied the Quran with. Thereafter he studied the foundational sciences of Islamic law, grammar and other subjects with his uncle Sayyid Muhammad Abd al-Aziz al-Ruqaymi (d.1367). After his passing away he kept the company of his cousins Sayyid Khalid bin Abd al-Baqi and his brother Sayyid Ahmad, with whom he studied. In the year 1384 Hijri he travelled to Makkah to perform the obligatory Hajj, bidding farewell to his family and heading towards Makkah intending to fulfill his obligation and take up residence. During his residence he attended the circles and lessons of Sayyid Alawi bin Abbas al-Maliki. He studied a number of sciences with him, amongst them being: Ibn Aqil in grammar and parts of Sahih Muslim and other works in hadith. After the passing away of Sayyid Alawi he attended the circle of his son Sayyid Muhammad Alawi al-Maliki (Allah Most High have mercy on him). Likewise he kept the company of Shaykh Hasan al-Mashat with whom he read parts of the Sahih of Imam Muslim, the Tafsir al-Jalalayn, Qatr al-Nada and other works in a number of sciences. He kept the company of Sayyid Muhammad Amin Kutbi and read a large number of works with him, such as Qatr al-Nada, Al-Mughni of Ibn Hisham and Ibn Aqil in grammar; Jawhar al-Maknun in Balagha; Taftazani and Sharh al-Izzi in Sarf; Sirah al-Nabawiyyah of Halabi and Suhayli; Jalalayn and other books. He studied with Sayyid Muhammad al-Arabi al-Tubbani in the Haram al-Makki al-Sharif as well in his home. He did not miss out on taking from Shaykh Muhammad Nur Sayf Hilal, as he read many books in different subjects with him in the Masjid al-Haram and in his home. He studied Islamic and Inheritance law with Sayyid Salim al-Attas. Sayyid Ahmad’s teaching career spans decades, with his being honoured with teaching in the Masjid al-Haram for a period of time. In addition to this he also taught at Shaykh al-Fadani’s school Dar al-Ulum al-Diniyyah as well as the Sawlatiyyah from which he retired relatively recently in 1428H due to old age. Despite his Ill health he still receives students who come to read with him in his home.